What’s a consumer mall without consumers? Indiana’s first major shopping center debuted with a bang and died so slowly and painfully that its end was little more than a whimper. 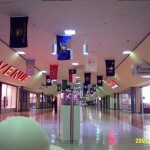 Opened in 1958, Eastgate Center was the first large-scale shopping center in Indiana. 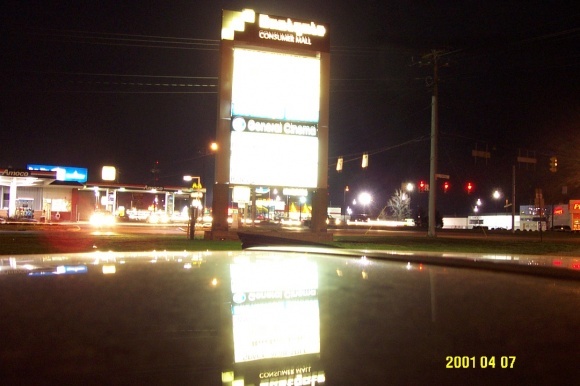 It located on the growing east side of Indianapolis, in what was then unincorporated Marion County, at the corner of Shadeland Avenue and Washington Street, which was then the heavily traveled cross-country National Road, US 40. After many years, and many changes, Eastgate finally bit the dust in 2004 and closed the doors, leaving its husk ripe for redevelopment. 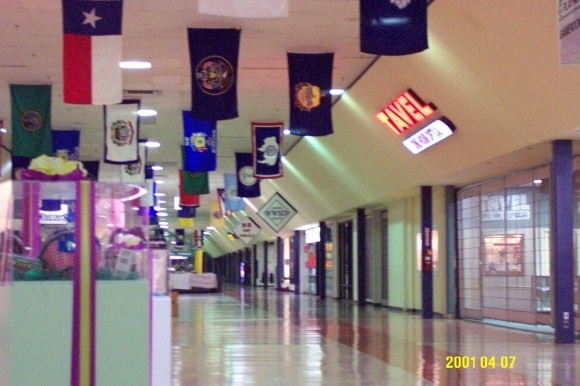 When Eastgate originally opened, the mall was situated very similarly to how it was in later years, on a north-south axis, with an anchor at each end. 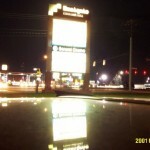 A two-level Indy-based H.P. Wasson’s was the north anchor, and a smaller JCPenney dry goods-only store as well as a Standard supermarket anchored the south end. Eastgate had a weird tilt to it, too – the south end of the mall was flush with the parking lot, but at the north end the mall was significantly higher than the parking lot grade, and many people accessed it there by either ascending a long stairway or going through Wasson’s and using the escalator. 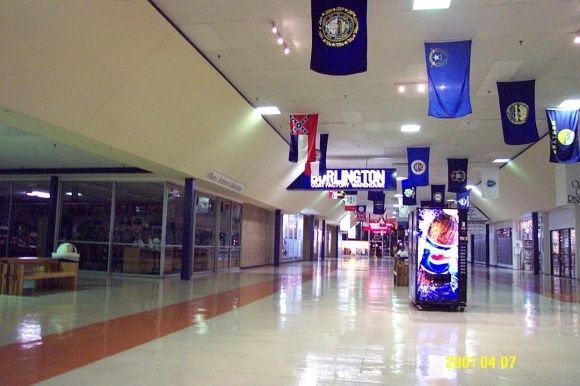 Inside the mall were G.C. Murphy and Woolworth five-and-dime stores, as well as venerable 1950s mall stalwarts Thom McAn, Kinney Shoes, Lerner Shop, a National Shirt Shop, Harry Levinson’s, and Dr. Tavel Optical – who would become the last original tenant at the mall, closing in 2006. In 1958, another open air mall arrived in Indianapolis when Glendale Center was built on the north side. 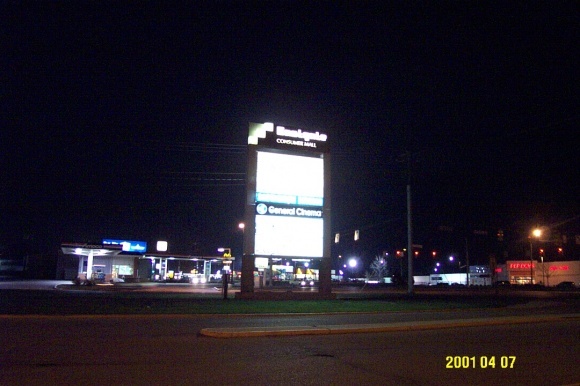 However, Glendale provided little competition to Eastgate, as Indianapolis was large enough to support two (or more) centers and Glendale was a good distance away. Both centers thrived for the good part of two decades, in spite of forcing kids to wait in line for Santa Claus out in the cold. Brrr! Competition did come a-knockin’ in 1974 with the opening of an enclosed, super-regional center just a few minutes away from the small Eastgate Center. 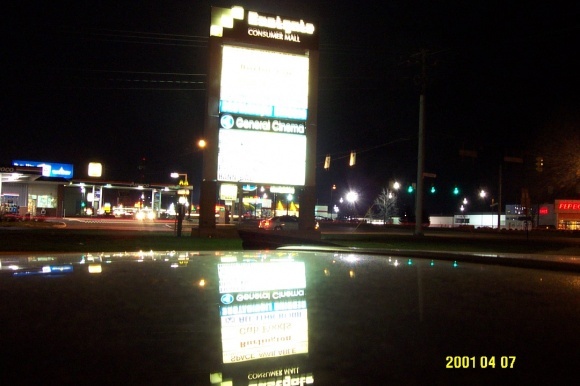 DeBartolo, an Ohio-based mall developer, opened Washington Square Mall just two miles east on US 40. Sensing a trend, and not wanting to be left out in the cold (rather literally…), Eastgate’s owner quickly enclosed the 370,000 square-foot mall – but it was too little too late. Penneys moved out, and when the struggling Wasson’s closed in 1980 it became clear that Eastgate was in rapid decline. In 1981, Eastgate was sold to Melvin Simon, an Indianapolis-based retail/real estate magnate, who promised to ease the mall’s woes and put it back on the path to success. And it did just that, for a while anyway. 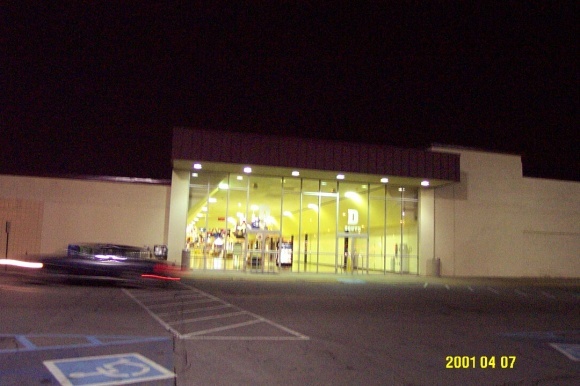 Burlington Coat Factory was brought in to replace the Wasson’s, and a mix of local and outlet stores were brought in to replace tenants who fled to Washington Square a few years earlier. 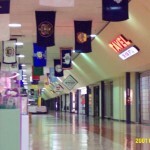 Eastgate Center was renamed Eastgate Consumer Mall, and continued on through the 1980s and into the 1990s as a discount-themed mall, which was also appropriate for the changed demographics of its immediate area. This part of Indianapolis was in decline, as more people moved out to greener pastures in the suburbs, which only further benefited centers like Washington Square and decimated places like Eastgate. 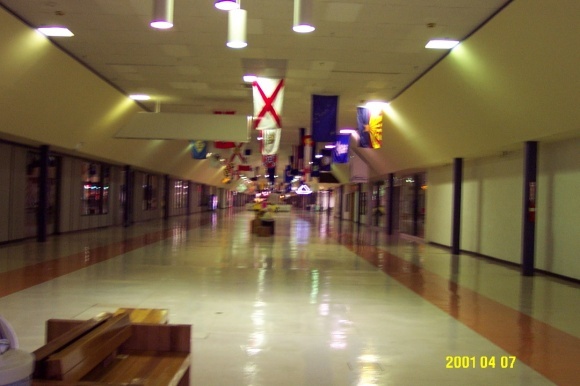 As Eastgate Consumer Mall soldiered on, even the outlet mall concept became a flop. 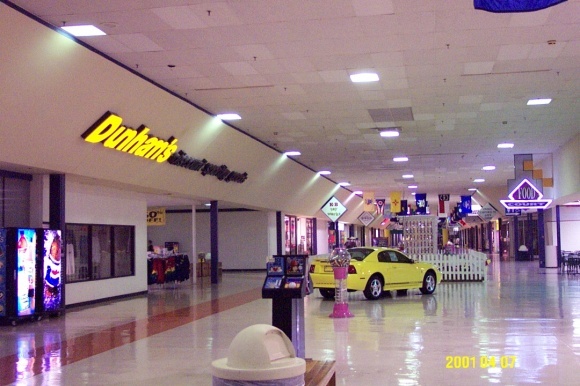 By the early 2000s, the mall was in decline again, as the caliber of stores went from okay to laughably nasty. 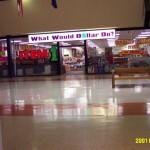 In April 2001, when I visited, there was a store actually called What Would D$llar Do? 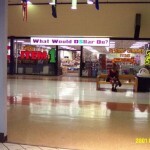 I wanted to answer, “Not shop in this mall?” but it seemed to be a rather moot point since no one was there anyway. However, I did get yelled at for taking pictures by a rather fiery security guard lady, who seemed to be chatting with her friends in the nearly empty food court at the time of my egregious photo-snapping crime and felt it necessary to shout at me from across the cavernous emptiness and waddle over to give me hell. Par for the course at this mall, I guess. Simon finally gave up the ghost and unloaded the mall in 2002 to a series of commercial slumlords, one of whom was Heywood Whichard, a slimy North Carolina ‘businessman’ who is infamous for craftily buying dead or dying retail properties and sitting on them, collecting rent with no reinvestment strategy whatsoever, until the properties are in such disrepair that almost nobody wants them. At this point the local government usually has to step in and spend taxpayer money to redevelop these blighted eyesores and Whichard runs away laughing, having made a tidy profit. This strategy has made Whichard the enemy of several cities around the country, including Akron, St. Louis, Niagara Falls, and Ft. Wayne. Whichard certainly made the death spiral worse at Eastgate, and the mall began to shake off tenants faster than ever before. Mini anchor Dunham’s Sports and The Finish Line left first. Then, Burlington Coat Factory, who had been at Eastgate since 1981, decided to call it quits in March 2004 by moving to Washington Square, seizing the opportunity of a recently-closed JCPenney there. 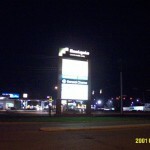 Burlington’s departure was the death knell for Eastgate, because in early 2004, Whichard gave a harsh and sudden notice, via a letter served by his attorneys, telling the 15 or so tenants operating there that they would need to skedaddle before the end of June or he would lock them out and take their stuff. 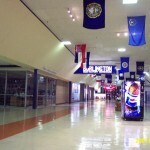 The interior of the mall closed in June 2004, and later that year Whichard did what he does best and sold the mall at a tax sale. 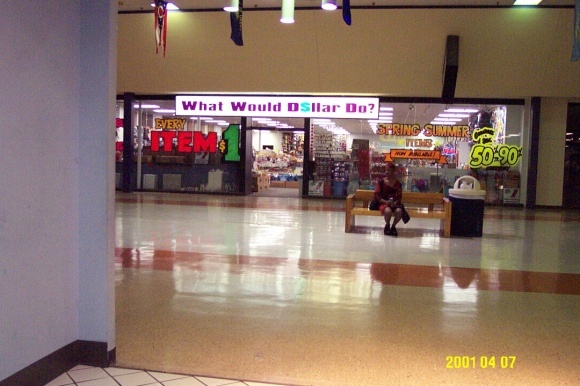 The empty dead mall went through several other owners, including a woman from Michigan City who wanted to turn the mall into a senior-based shopping and entertainment center, and a Texas firm who did nothing. Not surprisingly, she abandoned her plans too, and the mall sat and sat. And sat. 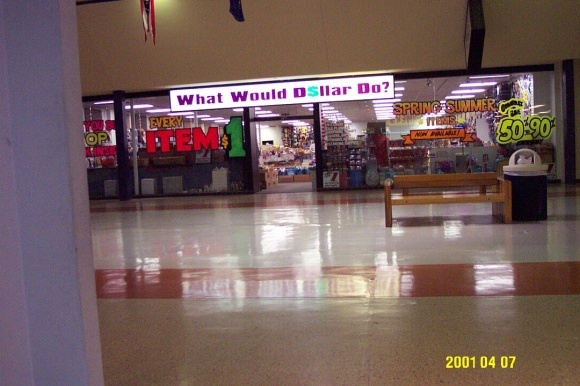 Meanwhile, Dr. Tavel, the mall’s lone remaining tenant, who was one of the mall’s original tenants and had an exterior entrance, continued to operate until his lease expired in 2006. Said Tavel in a 2003 interview in the Indianapolis Star, “One of the keys to our constant viability in that center is the fact that we always maintained an outdoor entrance,” he said. “That back door became our front door when the mall went to hell.” Well put. In recent years, ruminations of redevelopment have finally reared their heads, which will give Eastgate new life. 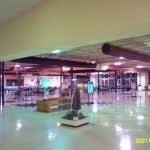 In July 2008, Lifeline Data Centers, an Indianapolis-based data storage outsourcing compan, decided to put a $50 million data center in the former mall. That same year, a group of U.S. Marines also used the mall to play war games, simulating urban combat for soldier training. In addition to the Lifeline project redevelopment, portions of the now-excessively-large parking lot will be removed and turned back to nature, with a landscaped park featuring walking trails and ponds. Although Eastgate Consumer Mall failed as a retail mall, it’s interesting that in the end it won’t be totally demolished and will have a use – as office space. 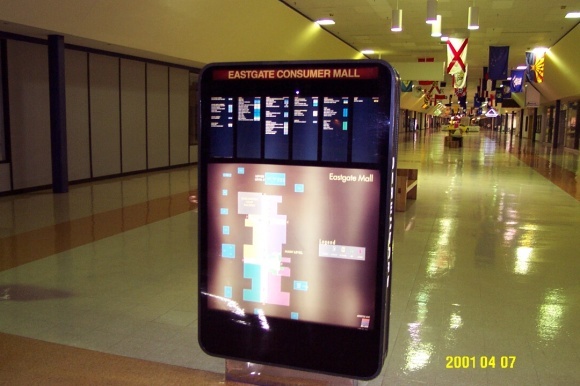 I visited Eastgate Consumer Mall in April 2001, just before Haywood Whichard got a hold of it and totally ran it into the ground, and took the pictures featured here. 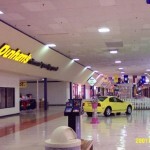 There was even a bright yellow mustang parked inside to offset any problems the mall might’ve had. For a more complete set of pictures, be sure to check out this Flickr page of photos of the mall from user penske14 . 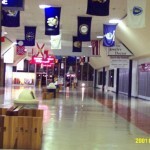 Taken in 2006, you can see that the mall quickly and alarmingly fell into disrepair, as evidenced by its condition less than two years after closure. Also, you can check out a Facebook discussion relating to the mall, or better yet, leave some of your experiences and thoughts on or own comments page here. This mall is unique in that the signs for the stores all seem to be up on that 45 degree tilted area. I don’t think I’ve seen another mall with the area above the storefronts done that way. 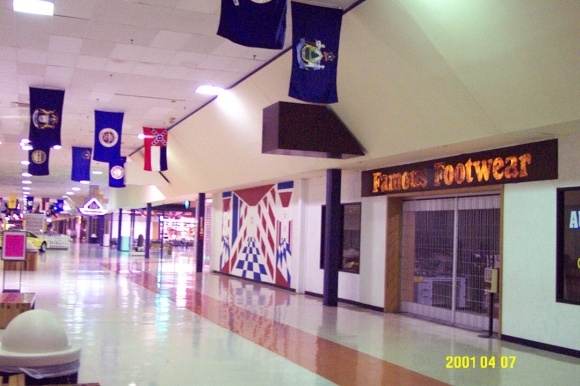 That mall was also an outdoor-to-indoor conversion, so maybe that’s why the walls are slanted? 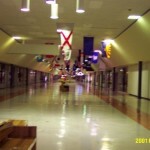 That mall oozes subway station, just dig a trench in the middle of the hall, put some tracks in and there you go. 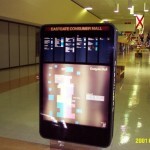 @Chris, Gadsden Mall that I covered is somewhat like this, but not nearly to this extreme. All the mall stores have that outward slant like that. This place, however, truly looked like a tunnel with that design. I am impressed at PrangeWay for getting to that place before it closed for good. I remember looking at pics of it recently and it was in severe disrepair as if it had been abandoned far longer. From the pics I saw there, it looked like the roof and ceiling tiles had been repaired countless times over the years. I like those beveled wall-tops for the signage…they help give the long corridor some architectural interest, since there doesn’t seem to be much in the way of natural light entering it. That, coupled with the glassiness of the storefronts, gives it a nice mid-century modern feel. Even those pendant lamps aren’t bad. 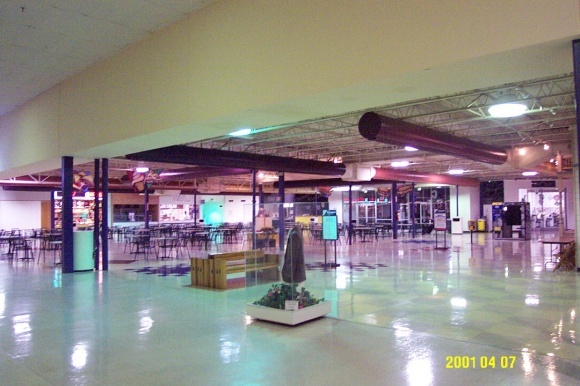 By replacing the dropped ceiling with some skylights (but not going for an industrial look like in the pic of the food court), using more contemporary paint/tile colors, and adding some trees and soft seating areas, they could have turned this into a really neat-looking space. So what was the Dunham’s previously? Was that the GC Murphy’s? The Penney’s became a Phar Mor if I’m not mistaken, then a furniture store? ‘s had limestone accents. The Standard super market had only a its diamond shaped logo. It’s in an odd area for a mall–much of the surrounding area is industrial and the road system makes it easily bypassed. It never grew the kind of retail hinterland that typically has grown-up near large shopping centers–Washington Square had that, although to a lesser extent than some other malls. The Industrial zones were mostly notable for having a lot of adult book stores. The area to the West has had a long slow decline as a residential area. The area to the East was sparsely developed for quite a while. The center was probably predicated on its US 40 location and Shadeland’s (and later I-465’s) ability to pull from N and S of the area. Glendale served a very different part of town–much more upscale and set among residential areas. 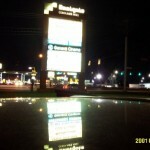 It managed to soldier on for many years after Castleton Square took away much of its customer base. 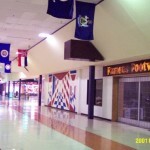 I remember reading when this mall was closing down. Also- what an ugly, dark, cheap mall. I remember shopping at Eastgate with my parents- I went to my first haunted house there in one of the empty stores- this would have been around 2000, as I didn’t go to haunted houses growing up. My friends and I used to go to their arcade and ride the little carousel that’s intended for little kids when we were around 13-16. Hookers was good, but we always ate at the Ryans that’s still open in an outlot. 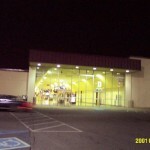 I remember reading about how Simon BEGGED General Cinemas to keep there 6-plex open while the mall was in transission. 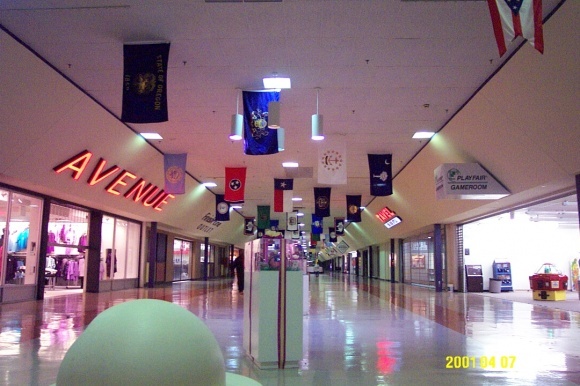 At that time GC Companies had several locations around Indianapolis, but like the mall GC was in decline & couldn’t fend off compitition from AMC, Regal & up & comeing circuits like Muvico. 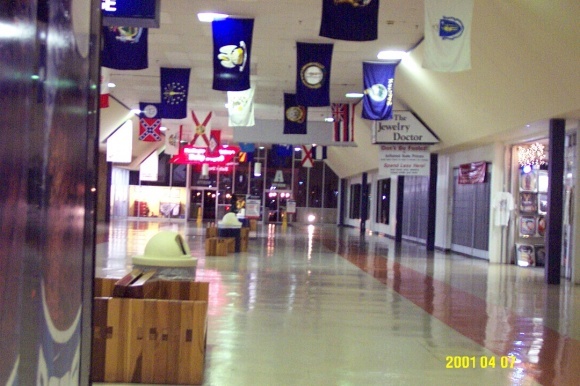 Is that a collection of state flags randomly hanging down the main concourse? I did a double take when I saw one picture with a Mississippi flag and one with an Alabama one. I have a question only tangentially related to this mall. What’s a “dry goods only” JC Penney? What wet goods did they ever sell? I’ve seen this term elsewhere and it’s always made me wonder. I grew up a block away from east gate in the mid seventies although I probably first visited the mall much earlier (1967 or 68?). I have no memory of it being open air but I do clearly remember the opening of Washington Square when I was in middle school. So I suspect the enclosure was earlier than described in this article. By 1974, I had logged many hours in the mall. One of my favorite things to do was ride my bike down the steep slope on the westside of the mall. We shopped at standard for our groceries. We bought our clothes at Wassons and JC Penney. GC Murphy and Woolworths were fun to browse thru although I never liked the smell of butterscotch and it permeated both stores. Cant remember what else was in the mall since it probably held little interest for a 10 year old boy. @John Riley, I grew up 3 blocks away. We moved there in 1960 on Mitchner Av. Warren Central class of 73. I remember when it was open air. I use to spend my allowance on model cars from Woolworth. Now I work for the data center as part of maintenance . It’s slowly coming around. The solar farm is about completed. what happened to that yellow Ford Mustang that was there when the top photo was taken?